If your third set of molars haven’t come in yet, you must be very young. These late-blooming teeth will often come in when you’re in your early twenties or as early as your late teens. Although some people will benefit from having them, a wisdom tooth will probably cause more trouble than anything for most. Wisdom teeth, if you have them, are found in the very back of your mouth. They are the third set of molars to come in. Anthropologists believe that they were needed to support the chewing of rougher types of food while humans were in their early stages of development. The diets of humans during these prehistoric periods consisted of foods that were difficult to chew when compared with foods that are available today. These foods included uncooked or barely cooked meats, leaves, nuts and tree and plant roots. Today, we don’t really have a need for them. As mankind evolved, so did his (or her) tools. These teeth have become mostly unnecessary with the meat tenderizers, ovens, broilers, forks, spoons and knives of today as tools. If your third set of molars have grown in and are not causing you any problems, there may not be a need to remove them unless your dentist has suggested so. Your dentist might suggest removing them if he or she foresees that their growth projection might cause you problems. The problem most people run into is the crowding that occurs. As we humans have evolved, our skulls and our jaws have gotten a lot smaller. The result is that there is less space available for the proper erupting of a third set of molars. The teeth next to them might obstruct their path of growth, but this doesn’t stop them from continuing on their course, and it can cause problems. One of the more serious problems with these teeth are cases of impacted teeth. This is when they are hindered from growing properly. The gums around them begin to swell, with pain as the result. The gum tissue on top of a wisdom tooth can also become infected. The reason infections are so common is the high chance of food being trapped under the gums surrounding them. This is the perfect place for the growth of troublesome bacteria. So, if the pain of an erupting wisdom tooth isn’t enough to convince you to have it removed, there will probably be other signals from your mouth that will do the trick. In general, once they are causing pain, they should be removed as soon as possible to keep things from getting worse. 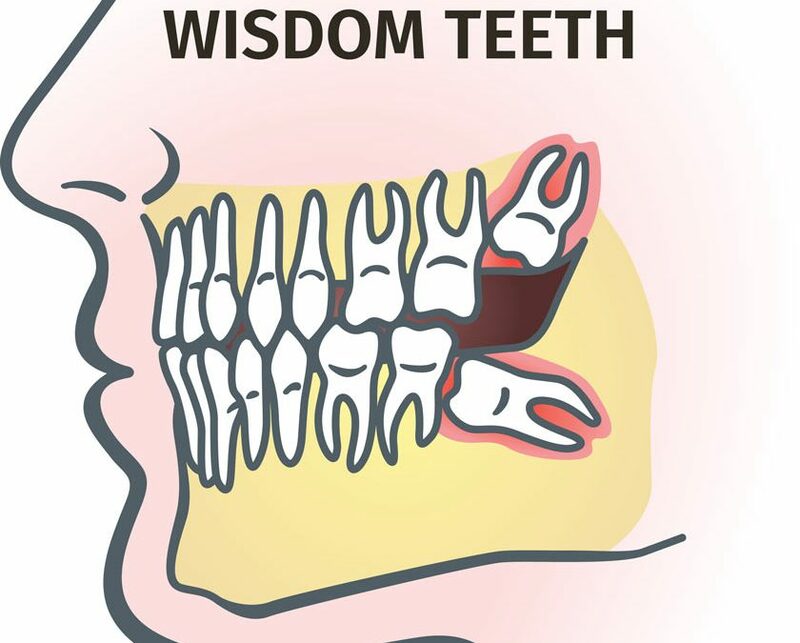 Our dentists at Midway Family and Cosmetic Dentistry know that wisdom tooth extraction is not needed for everyone. Some people do well with having them, and many don’t even realize they have them until they are mentioned during a visit to the dentist. Sometimes, failing to have a wisdom tooth extracted when you should can have negative consequences. Some people don’t visit the dentist often enough to detect problems early. This can happen for a number of reasons, including lack of resources or an indifferent attitude toward oral health. There has been shown a risk of developing heart disease and eventually having a stroke if gum infections aren’t resolved quickly or prevented. This is especially true for elderly people suffering from diabetes or who already have a heart condition. Research has shown that bacteria that is formed during gum infections can enter into the bloodstream and affect the heart. Our highly qualified dentists know the warning signs to look out for. Schedule an appointment with us at Midway Family and Cosmetic Dentistry for a consultation, just to be sure.